Forged from special Protanium™ steel for extra-high torque, these L-Wrenches feature handy Balldriver® ends. They are coated with black Proguard™ Dry Finish, which promises up to five times more corrosion resistance. 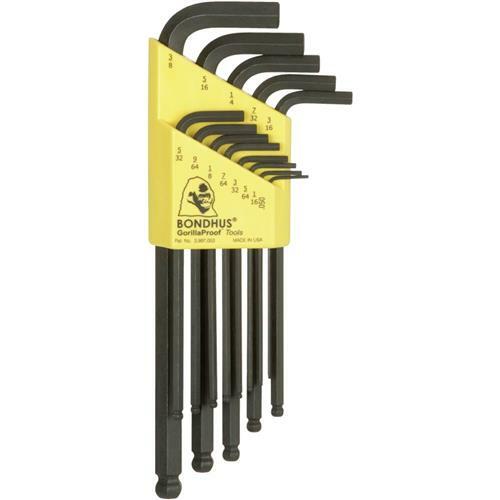 Packaged in the patented Bondhex™ tool case that doubles as extension/leverage handle, and is proudly made in the USA. This set includes sizes: 1/20", 1/16", 5/64", 3/32", 7/64", 1/8", 9/64", 5/32", 3/16", 7/32", 1/4", 5/16", 3/8".